KILIÇ ALİ PAŞA HAMAMI 1580, Karaköy / İstanbul, Turkey. Information, Photos and Reviews. 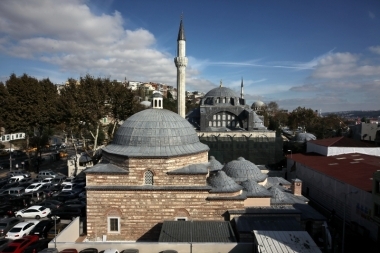 Commissioned to the great architect Sinan by the famous Ott oman Admiral Kılıç Ali Paşa as part of the mosque and school complex, Kılıç Ali Paşa Hamamı was constructed to serve the marine forces in the Ottoman navy. You may also share this incredible experience with your beloved ones by presenting our gift certificates either for an unforgettable hamam experience or a rejuvenating massage treatment. Accompanied by their moms or dads, our guests between 6-12 ages perhaps will be experiencing the most enjoyable bathing session of their lives. And our litt le guests, aged 1-5 years, may benefit from this service completely free of charge. For a comprehensive relaxation aft er your hamam journey, you may choose from our massage services provided by our professional therapists. It might be either a local application as per your preference or a full body massage treatment offering you a thoroughly tranquil experience. • Our prices are inclusive of VAT (Value Added Tax), exclusive of service charge. • Tipping is an ancient cultural expectation. If you are happy with the service given and would like to show your appreciation, you can tip your att endant by using the envelopes in the Reception area. • Our rates are valid until 01.04.2017. • To be able to give you a better and faultless service, please kindly make a reservation before your visit. • We will be providing you all the materials you might need (such as peştamal, slippers, towels and shampoo) during your hamam experience. We kindly would like to advise you to bring spare underwear and/or bikinis/bathing suits. 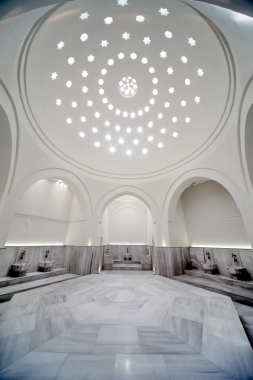 • All the materials provided during your visit to hamam can be used only within the hamam premises. For the guests, who would like to purchase them, our store “Derya” is located just next to the entrance of our hamam. • As per our hygiene principles, the scrubbing process is realised by the kurna (water basins), not onthe hexagonal heated marble platform. Food and beverage consumption is not allowed in all the wet areas. We would be pleased to provide further explanation for our guests who might require additional information. • Traditional Hamam Ritual service does not include massage application. Our oil massage services are given by our professional therapists in specially designed massage rooms and separate reservation is required. • Should you need any further information or assistance, you may visit our website or send us an email to info@kilicalipasahamami.com. • If you arrive late for an appointment for 15 minutes or more, your reservation will be cancelled and last minute changes to appointments will be honored only if there is availability. Az Cok Thai - istanbul (0.2 miles) - Serving Authentic Thai food for lunch and dinner. Everyone is welcome. Lattas Coffee - İstanbul (0.3 miles) - Best coffee shop of Galata! Nobody has reviewed KILIÇ ALİ PAŞA HAMAMI 1580 yet, Be the first. You are submitting a booking enquiry. KILIÇ ALİ PAŞA HAMAMI 1580 will then contact you by email with details of availability and prices.